The primary reason for travel was to attend Fish Breeders’ Round Table discussions of molecular genetics and breeding in Norway. 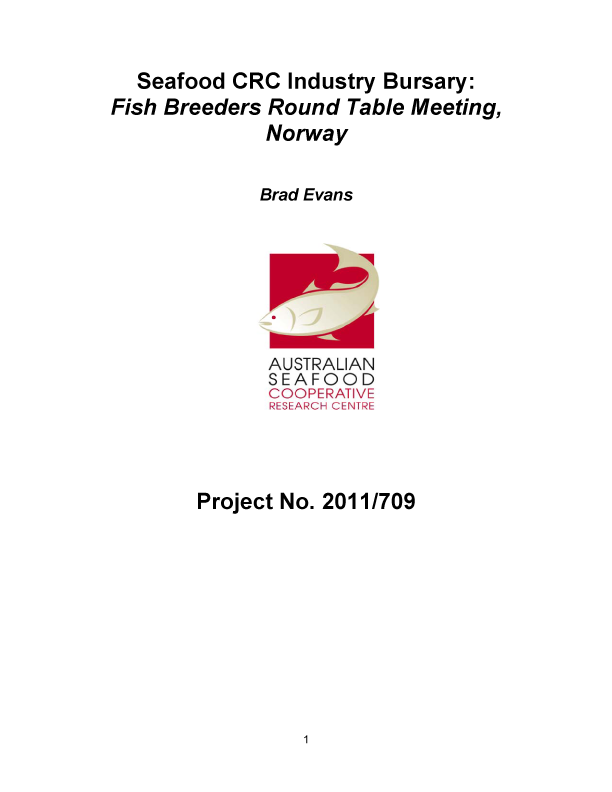 The Fish Breeders’ Round Table is an international forum that is held every four years in Norway, where knowledge and experience is exchanged between fish breeding researchers and those involved in applied genetic improvement work on a commercial basis. The forum is structured such that at least one person per attending company or institute gives a presentation at the meeting. No proceedings are published, ensuring that outcomes of the meeting are for those actively attending only. To take full advantage of the support provided, he also undertook visits to breeding companies and scientific service providers throughout the European Atlantic salmon breeding sector; and spent time in the offices and field stations of AquGen and Marine Harvest in Norway, and Landcatch Natural Selection in Scotland. Mr Evans was able to enhance his knowledge and understanding of the various approaches taken to genetically improve Atlantic salmon stocks in the major salmon producing countries of Norway, Scotland and Chile.